Nellie massacre took place in 1983 in the backdrop of tension between Centre and Assam students’ outfit over deletion of ‘foreigners’ from electoral rolls. Assam has witnessed violence on many occasions since Independence over the issue of identifying ‘foreigners’, or illegal immigrants from Bangladesh. Even today, there is a political uproar over the National Register of Citizens (NRC) and Citizenship Amendment Bill, 2016, both dealing with the ‘outsider’. The most violent protests on this count broke out on 18 February 1983, and culminated in a horrific bloodbath known as the Nellie massacre. Nearly 2,000 Muslims were slaughtered by a mob in just six hours. ThePrint recalls the events leading up to the day on the 36th anniversary of the tragedy. The ‘foreigner’ issue dates back to Partition. However, it gained momentum in the late ’70s when regional groups raised it as part of an agenda on illegal migrants. Ahead of the 1983 Assam elections, the Congress government at the Centre opposed the deletion of the names of such ‘foreigners’ from the electoral rolls. In response, the All Assam Student’s Union (AASU) challenged the Centre — opposing the inclusion of ‘foreigners’. Talks between the Indira Gandhi government at the Centre and the AASU leaders were inconclusive and the outfit began to mobilise the local population against holding elections in Assam. In January 1983, top AASU leaders, including Prafulla Kumar Mahanta and Bhrigu Phukan, were arrested and the Centre announced elections on February 14,17 and 20. Two prominent newspapers in the region, Assam Tribune and Dainik Asom, which supported the movement, were restrained from publishing reports related to the ongoing agitation. AASU, along with the All Guwahati Student’s Union and the All Kamrup District Student’s Union, organised the anti-election agitation on a large scale. The agitation turned violent in Assam: Several bridges were burnt and roads blocked to prevent access to the polling booths and the family members of the candidates who had applied for nominations were kidnapped. Reports from the Tewari Commission that conducted an official enquiry into the riots note that between January 1983 and March 1983, 545 attacks took place on roads and bridges, and over 100 kidnapping incidents were registered. It said that 290 incidents of police firing and lathi charge — in order to curb the agitation — were reported in Assam. In order to ensure security during the polling, around 65 battalions of the Central Reserve Police Force (CRPF), along with several other forces, moved into the state. However, the forces were not of much use as they were unaccustomed to the terrain, the locals as well as their language. They were forced to depend on the local police for guidance, who were hostile. 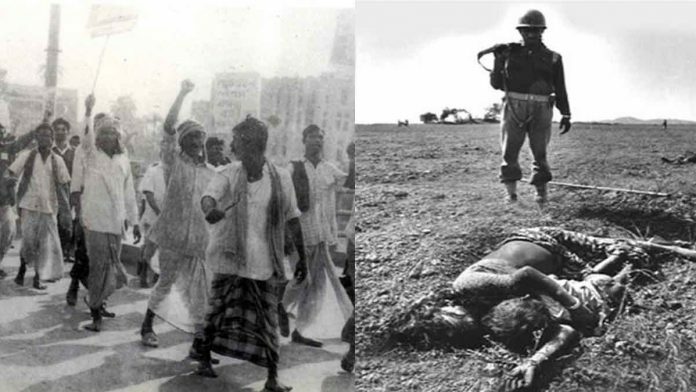 At the height of the protests, relations between the Muslim and Hindu communities deteriorated, leading to the Nellie massacre. It started in a systematic manner in Borbori village on the morning of 18 February, 1983. Nellie and 13 other villages were surrounded by a mob armed with guns and machetes. In the bloodbath that followed, over 1,800 people were reported killed while the unofficial death toll is as high as 5,000. The majority of victims were women and children as men were able to run fast and escape the rampaging mob. Although a total of 688 cases were filed in relation to the massacre, the police filed charge sheets in only 310 cases that were eventually closed, and not a single perpetrator was punished. AASU claimed that violence had broken out due to forced elections. That year, the Congress won the Assam elections with a thumping majority by securing 91 out of 109 seats. Two years after the Nellie massacre, in 1985, the Assam Accord was signed — fixing the cut-off date to identify the foreigners as 24 March 1971, the day before the Bangladesh Liberation War began. Goverment should take immediate action against the writers and publishers of such articles, which have the potential to incite communal violence. These killers must be punished. These were barbaric bloodthirsty devils.they ought to be punished.even today there is danger from these type of people.when law is weak there is chaos.law and policing should be strict.these riots benefit some people.politics and hatred agenda with blood of innocent people. My house in Assam is barely 12 kms from Nellie. My family witnessed the horror first hand. This article does injustice to the issue and almost dehumanises it. All this information can be got on a Wikipedia page. Where is the human angle? In light of similar sentiments infiltrating the people of Assam again, please continue this story into a series and talk to people in the towns of Nellie and Jagiroad to get some more insight. Everyone in India needs to know this incident. The Print deliberatelyb left out the IMDT Act 1983 to protect minorities w.e.f two days before Bangladesh independence and Assam Accord 1985 w.e.f. one day before Bangladesh independence, all of whom were from East Pakistan, hence, Bangladesh deny any immigrants in India. Why did you conceal these vital facts. IMDT Act. was based on minorities (read) after Nelie and continued in Assam only making difficult for citizens to object. The SC cancelled the Act. for it was undemocratic. Nellie has vanished from our national consciousness. It deserves to be there with 1984 and 2002.